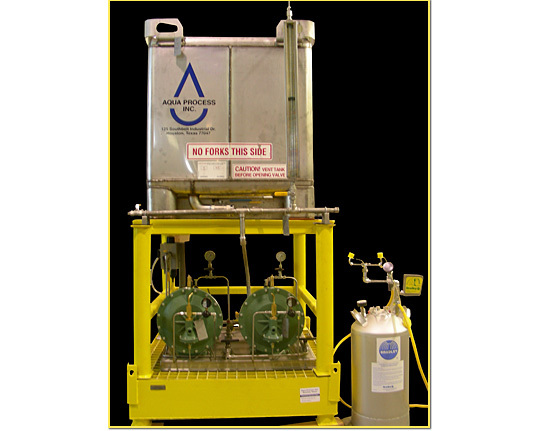 Lube Extraction Antifoulant Aqua Process Inc.
AQUA PROCESS BUILDS CUSTOM-DESIGNED CHEMICAL INJECTION SYSTEMS for both industrial plants and off-shore platforms. These systems come complete with secondary containment, chemical pumps, chemical storage tanks and eye wash stations, if needed. Units are supplied in combination 304 and 316 stainless steel. The containment basin can be either 304 stainless steel or carbon steel, meeting NACE coating specifications. Roll your mouse over the images to see the enlargements.